During the Makers Faire'10 in Detroit Ford's Museum, I was working with Andrew, Den Hag'cker I call him, cous' he was born in Den Hague (NL) and his family moved to Michigan State when he was 4 years old. Makers Faire is an initiative to demonstrate to a larger audience how technology can take different forms in our everyday life. 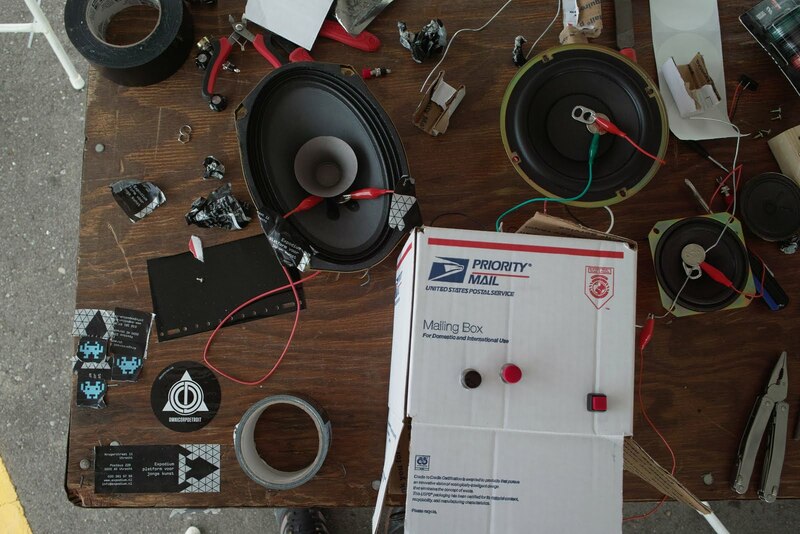 Den Hag'cker is working with OmniCorpDetroit, a new initiative for electronic hacking, ranging from music making machines to bicycle powered batteries used in small cars they put together, passing through Tesla coils. 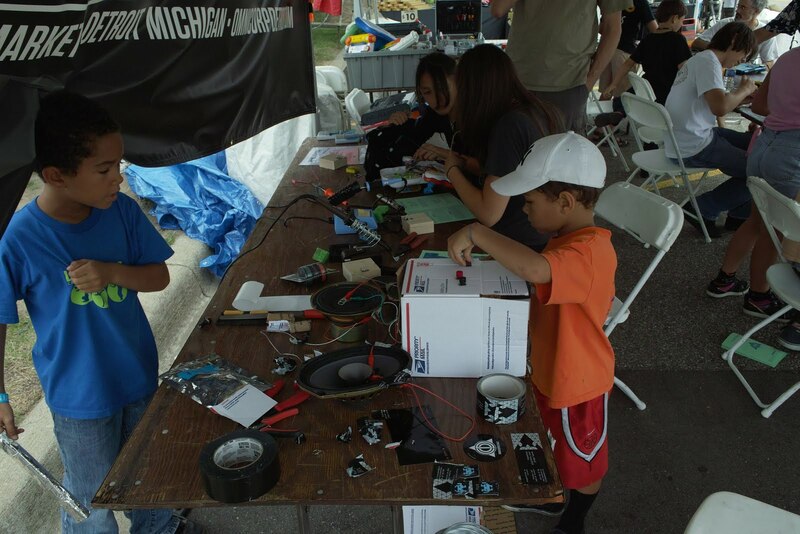 During the Makers Faire, OCD decided to teach children how to circuit bend toys. I proposed a complementary activity, which turned out to be antagonistic to the concept OCD proposed, the simplified activity of how to make something out of nothing. By picking up objects that can be commonly found in the city's garbage (a broken radio speaker, an abandoner car speaker, a ghetto blaster subwoofer) I showed kids how to make their own speaker-piano. 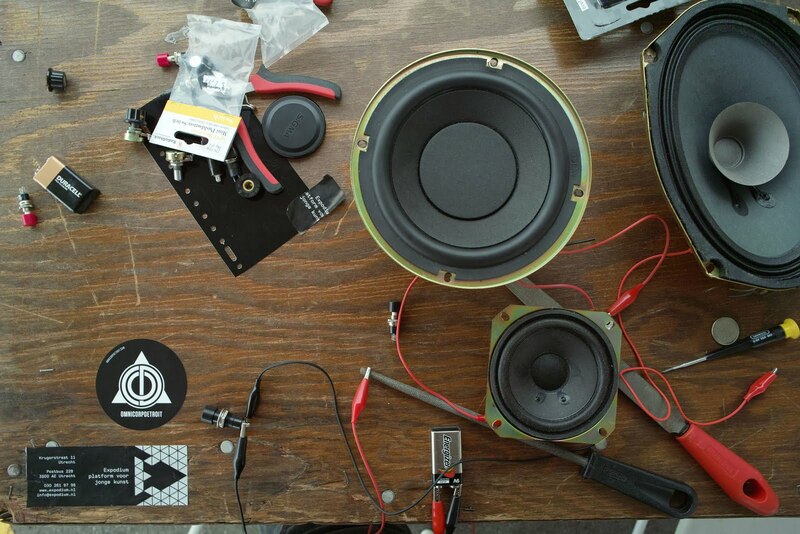 The intention behind was to dismystify and revealing how sound is produced, having the speaker connected to the 9 volt battery and by interrupting the circuit with various metal objects, and their movement, producing different sounds with, literally, your hands on it. Circuit bending a toy, is basically opening up an electronic toy, and look at the chipset inside. 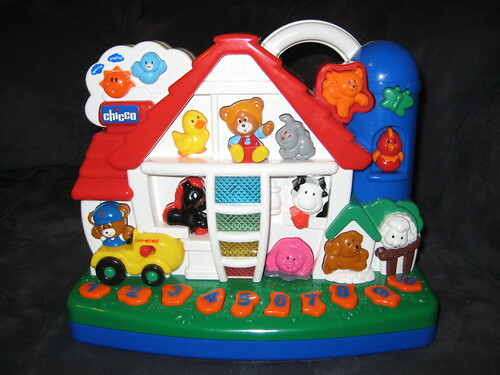 By touching different circuits while the toy is playing, the sound will bend. after mapping the circuits that create interesting sound bends, oneself can start soldering them and make some custom changes. One of the children was utterly cheerful because there was an animal farm sounds toy which she hated and finally she could open it up and hopefully, make something else out of it. She started by saying that she had never done this before, and that it was the first time she was ever opening up a toy. Den hag'cker and I were a bit confused how a kid never opened up a toy, something so usual to our childhood. We started questioning why and when did objects became so sacred, far from human touch. A nostalgia trip to our childhood made us recall all the things that we opened up, and messed around. How many radios, toys, broken electric tools, tv remote controls that we 'profaned' while disassembling. While nostalgia tripping to memory lane, we both started to realize when was it, in the last 20 years that kids stopped opening up electric objects and tweaking them. We both agreed that, somewhere after the invention (and application to most everyday technological objects) of the microchip, mechanical parts went beyond human touch, due to their reduced size. The conception of micro, of the barely visible made all those mechanical parts out of touch and out of range from amateur ([French, from Latin amātor, lover, from amāre, to love.]) ability to re-work, and re-cycle, all those mechanical objects.